Performance Dogs in Action offers a variety of obedience classes at all levels. We have basic obedience for those looking to set the foundation of a positive behavior skillset, teaching sit, down, come and stay. You can then move onto agility -- or just have a nicely trained dog. We also have classes geared toward competitive obedience, as well as rally. See class schedules and trainers below. Teaches basic obedience, competition obedience for novice dogs, and rally. A friendly environment for young dogs and beginner handlers. Dogs learn to interact with their handler and learn social skills. This class is fun and paced at individual speeds of learning. For dogs 60 pounds and under. All levels welcome. A very friendly class for those looking for a supportive environment. Along with basic obedience, this class teaches rally and gives helpful tips for confirmation showing, and social behavior. 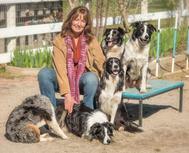 Bonnie has shown her rough coated collies in rally, obedience, agility, herding and confirmation for over 20 years. This class is a combination of obedience and agility. It's low impact format is geared toward growing puppies. A friendly environment for first time handlers and a great opportunity for social interaction as your new family member acclimates to new surroundings. Nola Jones in the owner and head trainer at Performance Dogs in Action and has dedicated her life to training.